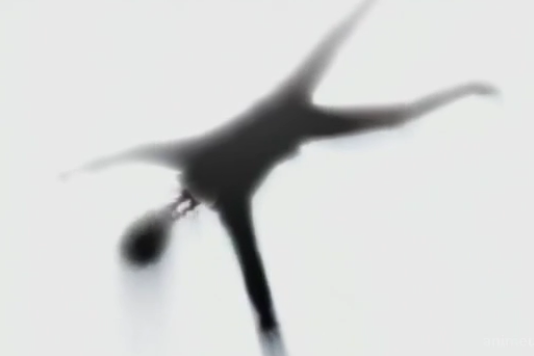 Gosick Episode 4: SO MANY MURDAAAAHHHHS! 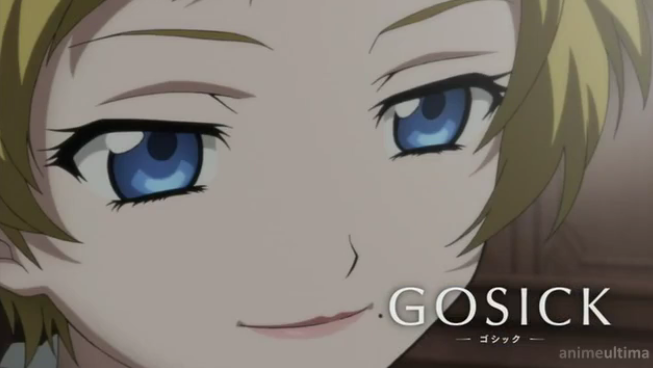 Note: Due to some late notice plans, Oki will not be covering Gosick this week. Please bear with my writing for this week, although I don’t believe it is horrible enough for it to be despised completely If you do I don’t give a damn anyways. I have a pipe. Therefore, I am a detective and I solve murdahhhs. KUJO KAZUYA IS ACCUSED OF MURDAAAAHHHH!!!! Damn, talk about an amazing way to start an episode.Anyways, Kujo is sent to Victorique and he re-tells her the story that happened before (his actions and his thoughts stalker Victorique o_o), which apparently brought him to be accused of murder IT’S A MURDAAAAHHHH. One day, Kazuya Kujo was asked to go shopping by Sophie, the maid. On the way there, while thinking of his soon to be girlfriend friend Victorique, he encounters a person on a motorcycle, who suddenly crashes and that person’s head falls off Isn’t it a lovely scene? 🙂. He then reports to Weirddudewithweirdhair, however is then accused of murder. THAT GIRL IS EEEEEEEVIL. She might not be the culprit for the murder from before that would be a little too obvious, but DAAAAAAMN she’s sure to be evil. I mean, look at her. That face, that look, everything about her just makes me want to punch her in the face and despise her as anyone would despise evil characters. She’s suspicious *stare*. *Close parenthesis* But back to my long and possibly boring summary. Kujo gives a tour of the HUUUUUUUUUUGE school to Avril GRRRR. 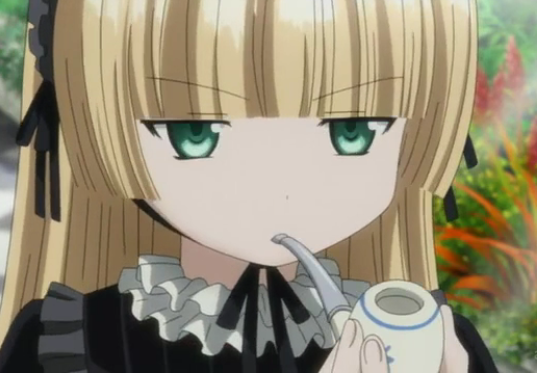 I don’t like that evil person., and finds himself thinking of Victorique once again just admit that you love her, come on, you can do eet! Another mystery then follows too lazy to explain, apart from the fact that another MURDAAAAAHHHH occurs, and in the end Victorique promises to solve the mystery surrounding Avril because Kujo trusts her NOOOOO DON’T DO IT, YOU SHOULD KNOW NOT TO TRUST STRANGERS (Especially if they give you cookies!). Kujo also turns his thoughts once again to the mysterious, shady, dangerous pretty, adorable, come on just admit that you like her Victorique. First of all, I loved how this week, although they focused more Kujo’s and Victorique’s thoughts about friendship last week, this time romance has started springing up, and it’s getting really cute. I love Kujo’s thoughts, he likes her for sure! Let’s forget about evil April for now, she’ll get imprisoned anyways for whatever crime she may have done, or at least I hope so. Second, YAAAAAAAY, BLOOD! YAAAAAY, A HEAD IS BEING CHOPPED OFF! YAAAAAAY, MURDAHHHS AND MYSTERIES!! I love the genre. Like. Totally. This show owns. Anyways, to go back to the actual episode and its mysteries, it’s obvious that all 3 mysteries in this episode (Motorcycle murder, Avril’s appearance and Maxim’s death) are related… The only thing I can notice is that EVERYONE HAS BLONDE HAIIIIR! I dunno exactly how the mystery will be solved… I don’t really want to anyways, because then it would ruin the fun of mysteries and the big explanation of who the culprit is in the end D: . Another mystery has yet started again, now let’s see how it continues next week! 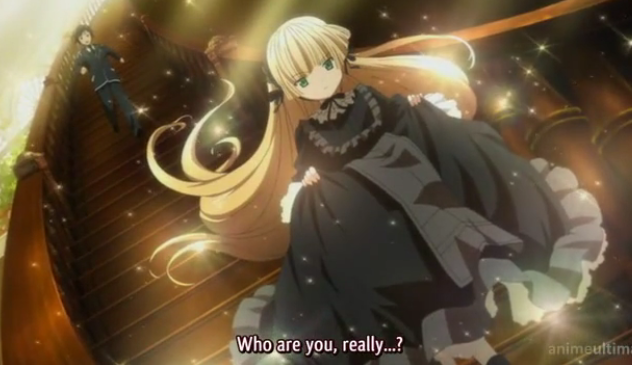 Tagged anime, episode 4, gosick, review. Bookmark the permalink.